The Co2mmunity partner Middelfart Municipality has published an article on the district heating project in its area. A small village is using local woodchips to fire a district heating, boldly supported by the municipality. Now people there have their heat supply in their own hands, save money and substantially reduced their emissions. Find the whole article here. It is halftime for the Co2mmunity project. We now have new and comprehensive stories from all our RENCOPs. The info is made available on our RENCOP page. This is a big milestone for the project as for the first time a comprehensive study on the conditions for community energy projects in the Baltic Sea Region is available. A lot of our work in the last 18 months has contributed to this achievement, such as the comprehensive set of case studies and the project database (external link) we have developed. 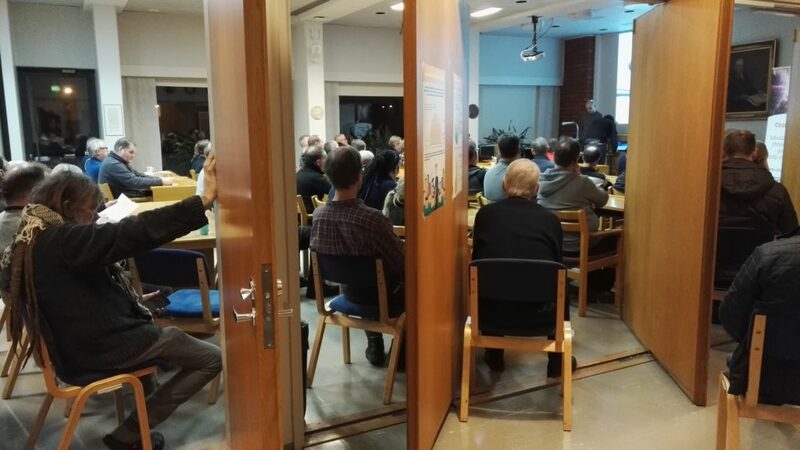 On the 20th of February in the municipality of Ilmajoki in South Ostrobothnia, three Co2mmunity partners came together to host a local solar energy information evening. 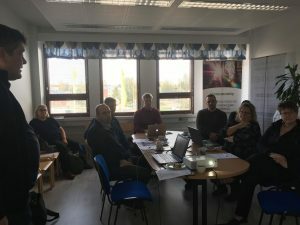 Regional Council of South Ostrobothnia and Energy Agency of South Ostrobothnia Thermopolis Ltd worked together with other actors to discuss and inform on solar energy. The organizational team was pleasantly surprised as more than 60 citizens, entrepreneurs, and farmers came to hear facts and local experiences on solar energy. This was even more than expected and extra room and chairs needed to be arranged. During the evening, many questions were answered, and lively discussions took place. The event partially originated from a discussion started by a local entrepreneur, who already runs a solar energy system both at his home and for his company, and he wanted to encourage other locals to buy solar energy systems for themselves. “For me the solar energy system has turned out to be a very reasonable investment, and I wanted to start a process for a common purchase and this way spread the common good”, says Juhana Lähdesmäki, a local entrepreneur. As a result of the event, all the participants were asked about their interest in buying a solar energy system and whether or not they would like to receive more advice, with 16 participants voicing their interest in an investment. All interested participants will be contacted individually and a follow-up meeting is being organized. If you have an oil furnace, you will get the chance to do something about it, because the 28th of February, the third round of common purchase of heat pumps will start, but this time it will be initiated with an interesting evening about climate, green transition and energy renovations the 27th of February. On the 25th February, energiebürger.sh holds a Workshop in Rendsburg. The participants will get insights into how the district has become active so far, what climate science predicts and what possible futures of the energy transition in the state of Schleswig-Holstein might look like. Afterwards it is time to discuss in small groups what kind of future is desirable and where the people need to become active to make the change happen. Find the invitation here and register to get one of the 30 places available until the 15th February. A major pillar of EU climate policy has always been the transition to renewable energy. With the proposed recast of the ‘Directive on the promotion of renewable energy sources’ energy communities have come into focus for renewable energy deployment due to their numerous benefits. Energy communities, as far as they are legal entities, are to be supported so that they can compete with larger actors. Also energy self-consumption up to 30 kW of generation capacity is protected by the directive. The text will now go back to the council for its final adoption. After being adopted there, it goes into force automatically as foreseen in the ‘Ordinary Legislative Procedure’ of the EU. This comes as part of the EU Winterpackage of 2016 that set the new climate protection goals of the EU. In June, the commission, council and parliament had already reached agreement on renewable energy, which has not been achieved in the area of energy efficiency. Second expert-driven RENCOP meeting held in Lapua, South Ostrobothnia 24th of September 2018 in the premises of Thermopolis Ltd. – Energy Agency of South Ostrobothnia (Lassilantie 12, 62100 Lapua). Ten experts participated to this meeting and represented participants from municipalities, research and development organisations, educational organisations and financers with a link to the citizens. New idea came up for an open citizen-driven RENCOP process, which is to give inspiration and organize events for ordinary villagers in Aisapari Leader area (includes following municipalities: Kauhava, Lappajärvi, Evijärvi, Vimpeli, Alajärvi and Lapua) to promote renewable community energy in the village houses of the area. 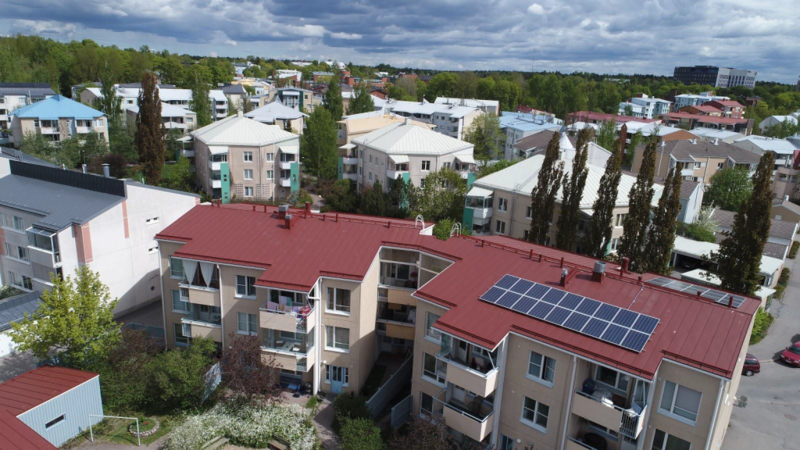 Many housing companies in Finland wish to install solar PV systems on their rooftops, as a survey from our partner Aalto University shows. Current legislation requires a major revamp of the metering infrastructure though. In response, Aalto University organised a breakfast for interested parties to discuss opportunities and barriers for solar PV self-consumption last week. The barriers to energy communities in housing companies made national news and during an interview the Finnish Minister for Climate and Energy promised a solution in the next year. The topic is especially important as Finland has no Feed-in-tariff scheme otherwise supporting solar PV rooftop installations.